An article detailing the changes in wrestling television programming following the WWF takeover of TV time on WTBS in 1984. Includes information on the return of Georgia Wrestling to TBS, Mid-South Wrestling on WTBS, and the eventual control of all wrestling time slots on WTBS by Jim Crockett Promotions. On July 14, 1984, wrestling fans around the country tuning into WTBS expecting to see Gordon Solie and Ole Anderson host "World Championship Wrestling" were shocked to see instead Vince McMahan stride onto the set and take the microphone from longtime Georgia wrestling sideman Freddie Miller. The World Wrestling Federation had taken over the wresting TV time slots on the Superstation, the result of gaining majority equity control of the company. The change sent shockwaves through the wrestling industry and deeply disappointed wrestling fans who shared a long standing relationship with the Georgia brand of wrestling. The following article details the many changes in wrestling programming that followed on the Superstation, culminating in the takeover of all wrestling TV time slots by Jim Crockett Promotions eight months later. After gaining control of Georgia Championship Wrestling, the WWF immediately shut down the wrestling operation. Their main interest was the 3 hours of national television time on Superstation WTBS (local Atlanta channel 17), as well as eliminating their competition in the state of Georgia which also gave them Ohio, Michigan, and West Virginia markets that Georgia had been running for years. Ole Anderson, who had been in control of Georgia Championship Wrestling, was forced out, but quickly aligned with south Georgia promoters Fred Ward and Ralph Freed (and weeks later maverick promoter Ann Gunkle) to attempt to continue promoting wrestling shows in Georgia and elsewhere. The first thing they needed, though, was TV. Meanwhile, the Macon GA tapings continued for the syndicated markets in Georgia, and continued to be a separate program from the WTBS show, although still both titled the same. On October 20, the complexion of the WTBS program began to change. An announcement was made on WTBS of a “merger” of three promotions which included Championship Wrestling from Georgia, Jim Crockett Promotions, and (surprisingly for fans) Jarrett Promotions out of Memphis. The merger storyline was in actuality a loose agreement by the three promotions to trade talent, and have combined talent featured on the national program on WTBS. On November 17, the syndicated show taped in Macon changed to a combined show of Memphis and Georgia regulars, hosted by both Lance Russell and Gordon Solie. This show aired in syndicated markets only, and did not last too long, although it's unclear when that arrangement ceased. Like many talent swapping arrangements between promoters, this one seemed to fall apart pretty quickly. Eventually, Ole Anderson’s group would be back on its own, with a show taped at WTBS studios and then aired on a delayed basis in the syndicated markets. In the early months of 1985, Anderson’s roster began to take its final form, as the company began to struggle financially. This group primarily consisted of Ole Anderson, Thunderbolt Patterson, Ron Garvin, Tommy Rich, Ron Starr, Scott “Hog” Irwin, Bob Roop, Ray Candy and others including the return of Buzz Sawyer, and a brief return of Gene Anderson. During all this time that the Georgia program was continually changing and evolving, the WWF shows on WTBS remained basically the same format they had assumed on Black Saturday back in July. The shows openings and wrap-arounds were taped in the WTBS studios in front of the same blue "World Championship Wrestling" logo that had been used by Georgia Championship Wrestling since the fall of 1982. There were no "live" matches. The format consisted of Freddie Miller introducing taped matches from various WWF TV locations and pre-taped interviews usually conducted by Gene Okerlund. Later, Miller would occasionally be joined by a WWF wrestler in the WTBS studio. The ratings for the two WWF weekend evening shows "World Championship Wrestling" and "Best of World Championship Wrestling", which had historically been two of the highest rated shows on all cable TV and certainly for WTBS when they were Georgia wrestling, began to drop. Ratings for Anderson's "Championship Wrestling from Georgia" show also suffered as the show languished in the early morning time slot, and as Anderson's talent pool grew thin and the company struggled financially. Ted Turner was unhappy with McMahon because Turner's original contract with Georgia Championship Wrestling included the proviso that the shows would originate from his WTBS studios. McMahon, who owned controlling interest in GCW, maintained that he was meeting that obligation by having the show taped and hosted at WTBS, even though the wrestling was taped earlier somewhere else. Turner was adamant that the wrestling matches be taped in his studios, but McMahon was not interested in bearing the huge costs of flying in talent to Atlanta every week to produce the program. The two were nearly at an impasse. McMahon blinked first. In January 1985, the WWF began taping matches in the WTBS studios. The show was hosted by Gorilla Monsoon and Freddie Miller and featured a new set. WWF wrestlers were flown in for the matches. McMahon was now actively looking for a way to get out of the WTBS contract and Turner was reportedly waiting for the opportunity to throw McMahon off the station. Turner began entertaining the idea of having another major promotion on the station. Two promotions in particular competed for the slot: Jim Crockett's Mid-Atlantic Wrestling, which had been involved with the Anderson group since they started up after Black Saturday, and Bill Watt's Mid-South Wrestling. Watt's would succeed in getting his hugely popular "Mid-South Wrestling" on WTBS, airing mid-afternoon on Sundays. Turner's plan was to eventually get out of the Georgia contract that McMahon now owned, giving Bill Watts the entire wrestling package and Turner hoped to get into the business of promoting wrestling events with Watts. "Mid-South Wrestling" debuted on WTBS on March 10, 1985. It was the same show that aired in the Mid-South territory, but was on a four week delay, so as not to hurt his local show in its broadcast markets. The plan was to eventually produce a separate program exclusively for WTBS. The result was that for a period of around three weeks, WTBS was airing wrestling from three different promotions: the WWF, Georgia, and Mid-South. Around the time the Mid-South show debuted, Vince McMahon secured a deal with Jim Crockett to sell the WWF's TV time slots on WTBS to Jim Crockett Promotions. The deal was reportedly brokered by Jim Barnett, a major shareholder in GCW, now a McMahon ally, and a confidant of Ted Turner as well. Crockett reportedly paid McMahon one million dollars for the time slots, which ironically he probably could have obtained at some point anyway, as McMahon was eventually going to be off the station one way or another. Crockett agreed to Turner's demand to tape exclusive shows from the WTBS studios, but Crockett insisted on being the exclusive promotion on Turner's station. Not only would he take the WWF's slots, but he would assume the early Saturday morning Georgia slot. The Mid-South mid-afternoon Sunday slot would be eliminated. Turner agreed, basically giving Jim Crockett the package that was originally going to go to Bill Watts. Now, just a few short weeks after McMahon had started taping live matches from the WTBS studio, the face of wrestling in Georgia was getting ready for another huge change. On Saturday, March 30, “Championship Wrestling from Georgia” came on the air as usual, except this time it was Tony Schiavone who opened the program with Ole Anderson, and it quickly became apparent to viewers that something was significantly different. Along with a few of the Georgia regulars (Thunderbolt Patterson, Tommy Rich, and Buzz Sawyer) were many of the stars from Jim Crockett Promotions including Magnum TA, Dusty Rhodes, Jimmy Valiant, Tully Blanchard, the Barbarian, Paul Jones, and others. The next week, April 6, 1985, Crockett Promotions debuted on the Saturday and Sunday evening time slots. That same Saturday morning, the final airing of “Championship Wrestling from Georgia” took place and the following week a Crockett show titled simply “Championship Wrestling” aired in its place. Turner honored his original agreement with Watts and the Mid-South show continued to air for the duration of their original three month contract. The final Mid-South show on WTBS aired May 26, 1985. Watts went above and beyond the call and told viewers that they should embrace the new Crockett programs and thanked viewers for watching his show while it had been on WTBS. "Mid-South Wrestling" had drawn tremendous ratings during its short run. With the acquisition of all time slots on WTBS by Jim Crockett Promotions, and with Crockett now beginning his expansion nationally, an era had come to end. The grand tradition of Georgia Wrestling as a major wrestling territory, which had died on Black Saturday but resurrected itself shortly thereafter, was now, sadly, gone for good in April of 1985. Tony Schiavone had replaced Gordon Solie as the voice of NWA wrestling on the Superstation. Solie of course continued as host of “Championship Wrestling from Florida” which he had hosted for decades. 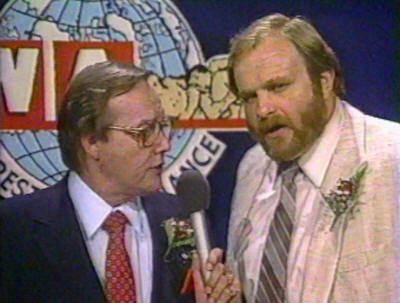 Ole Anderson became a full time wrestler once again for Jim Crockett Promotions, and would remain a familiar face to wrestling fans for many more years on Superstation WTBS. Anderson would prove to be the common thread in Georgia wrestling that linked all eras together. He was a major part of Georgia Championship Wrestling in the 1970s and early 1980s both as a wrestler and a booker, the promoter of the resurrected Georgia promotion after Black Saturday, a top star for Crockett Promotions that followed on TBS, and would be heavily involved in Turner's WCW that rose from the purchase of Jim Crockett Promotions in 1988. Anderson would continue as either a wrestler, manager, or booker until the mid-1990s. 03/30/85 - Crockett Promotions takes over "Championship Wrestling from Georgia"
04/06/85 - Crockett takes over WWF timeslots, "World Championship Wrestling"
Dave Meltzer (WrestlingObserver.com) and David Bixenspan.